Of all the sugars soft dark brown sugar is my favorite one. I love it's beautiful color and aroma, and the texture it gives to the baked goods, and of course, that deep caramel flavor only the dark brown sugar can add. And you know how much I love coconut oil. Now you probably have guessed how much I loved those cookies. These were the chewiest cookies I've ever made. Really. Both the edges and the centers are chewy and not cakey at all. They don't have any additions like chocolate chips and, trust me, they don't need any additions. In order to get perfect cookies, there's one trick. I always repeat that it is very important to slightly underbake your cookies. 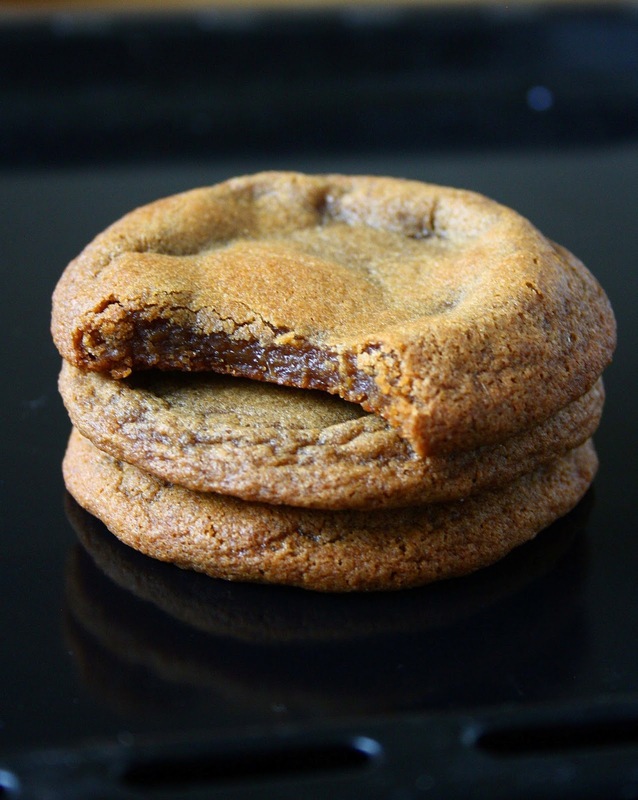 If you remove them from the oven when their centers look underbaked, you'll get chewy cookies. Easy. Let them cool for at least 10 minutes. 30 minutes preferably. 1) In a large bowl, beat together coconut oil, dark brown sugar, egg, corn syrup and vanilla extract until light and fluffy. 2) Add flour, cornstarch, soda and salt. Mix just until combined. 3) Roll the dough into the balls (I got 12) and place on a baking tray lined with a parchment paper. Leave a lot of space between each cookie - they will spread. Refrigerate for at least 2 hours, preferably overnight (you can freeze them as well). 4) Preheat oven to 180C / 350F. Bake for 8-10 minutes (10-12 if frozen; do not defrost before baking) or until golden brown. Remove from the oven even if the centers look underbaked. That will give you chewy and fudgy texture. Allow to cool for at least 10 minutes before serving. Would honey or maple syrup work in place of golden (corn) syrup? I think you could try using it. There's just a small amount of syrup in these cookies so this substitution shouldn't affect the result. Thank you!! By soda do you mean cola or baking soda?